I need to apologize in advance. I strive not to be publicly critical of others. The hitch is that I promised to write this book review. As it turns out, the book in question is not one that I loved. This past January, Leslie Roberts (Once Upon a Time & Happily Ever After) offered an incentive on her blog for readers to receive a copy of Rachel Hollis’s book ‘Girl, Wash Your Face.’ I had heard briefly about ‘Girl’ and knew that it had been on the New York Times Best Seller list (for 32 weeks). I entered my name and, voilà, Leslie generously sent me a copy. Leslie and I quickly established a pattern of writing back and forth to each other after every chapter read. We did this at our own paces, in a non-hurried manner. This gave us room for more in-depth discussion. We also brought our unique styles to the review process with Leslie taking a much more personal approach and me usually being the devil’s advocate. Beginning with the positives, this book is an easy read that offers solid reminders. Although none of these ideas are new, they do make sense. The problem is, Hollis tells us all of this in Chapter One and keeps repeating these thoughts, sometimes repackaged, throughout the next nineteen chapters. I smell word count! Being fair, Hollis does add in other advice of value. Repeatedly blowing off the promises that we make to ourselves (in order to please everyone else) is not okay. Bringing others down will not elevate you (no matter how hard you try). Our judgments keep us from connecting in more profound ways. We become trapped in the surface-level assumptions that we make. Just because you believe it doesn’t mean it’s true for everyone. When you are feeling unsure of yourself, or just had a significant life change, stay off of Pinterest. Again, these are wise sentiments, but which of these is new to you? Despite my best efforts, Hollis’s writing simply did not grab me. I tried hard to remain balanced. (Honest, I did!) I diligently found and noted as many positive takeaways as I could. Nevertheless, Hollis’ (poorly written) words increasingly struck me as shallow and repetitive. To add insult to injury, her expressions were often annoying and sometimes downright horrifying. “Keep on trucking,” “so stinking thankful,” “y’all,” “obvi,” “we are doing pretty good,” and calling her coworkers “cats,” fell into the first category. The worst of the later included, “Lord Jesus, I’m going to rip off both (my son’s) arms and whack him over the head with them.” After that poor choice of imagery, she later went on to describe obsessively planning her husband’s and children’s funerals as a coping method for her fears. I still shudder thinking about it. Hollis unequivocally claimed, “The mamas who follow me in Dubai have a lot of the same concerns for themselves and their families as the mamas in Manila or Dublin or Mexico City.” She shared with us that her proudest moment was when she purchased a $1,000 Louis Vuitton handbag. She then went on to say that one of her top goals is to own a vacation home in Hawaii by the time that she is 40. Reality gap — this privileged thinking is not representative of most “mommas around the world.” Enough said. Believing there must be something that I was missing, I read a free sample from her earlier book, ‘Party Girl.’ A reviewer on Goodreads had given it a two-star review (a fact that Hollis vehemently lamented in ‘Girl’). Let me share a taste of that this book (based on Hollis’ real-life experience) so that you can judge for yourself. Still, I am glad to have read this book. Receiving it from a blogging friend (who jumped several hoops to ensure I received a copy in Canada) was an unexpected kindness. Being able to share our different perspectives back and forth, in a private, and safe manner, deeply provoked my thinking. Reading the strong, personal thoughts that this book brought out for Leslie, reminded me that although Hollis’s words didn’t resonate with me, they can (and do) have an entirely different effect on others. You can read Leslie’s review here. Have you read ‘Girl,’ or any of Hollis’ works? If so, I’d love to hear your thoughts. HI, Aimer – I do try to live by the motto “praise publicly, criticize privately,” but I did promised ahead of time to write this review. Besides, If we can’t be honest about the books that we read, what else won’t we be honest about? Hi, Aimer – The photo is by Nicole Honeywill (Unsplash). I did tag the photo credit to the photo…now I need to figure out where it disappeared to! HI, Leanne – One of my favourite things about discussing books is the myriad of different interpretations and takeaways that are generated. I don’t view Hollis as “having it all.” I do believe that she tried hard to show us the “unglossy” side of her life (but ya, gloss was definitely all over the place). I believe that Hollis would like your post on Expectations. It’s a great piece! Whoa! What an awesome review! Now I can’t wait to read what Leslie says about it! One question, what’s wrong with using y’all? Is it because she’s not a southern girl, just curious? Hi, Hilary – Although I LOVE discussing books, it was very difficult for me to press “publish” on this piece. Thank you for your kind words. I highly recommend Leanne’s post on ‘Expectations”. It is very thought-provoking…and liberating! It’s frightening to know her book was on the NY Times best seller list for 32 weeks! And how Hollis used to cry herself to sleep each night until her book became #1. Her husband videotaped her and put it out there on YouTube. Rachel is a role model to thousands of young women, young moms and young career women throughout the world. I shudder at the madness of it all. The woman is illiterate to say the least. Her followers call their group ‘tribes’. Think Girl wash you face is bad? Try reading her next hit: Girl, Stop Apologizing. Right in the introduction she states she got her inspiration from Demi Lovato’s, hit rap song ‘Sorry, Not Sorry’. You know, the hip female rap star, Lovato, who overdosed on heroin and almost died. The drunken, drug infested, fowl mouthed (listen to her inspiring video and try to count how many times the woman uses obscenities) was Hollis’s inspiration. Hollis used to play this song aloud and dance to it with her kids in tow. What a wonderful role model Hollis is. NOT! It’s exhausting. The reason why I read these books is because my 42 year old daughter is obsessed with Hollis. I wanted to find out what was so great. My adult daughter is now heavily involved in social media and is on a campaign to be the next Hollis. Hi, Cindi – Thank you for stopping by and sharing this link. I took a quick peek at it yesterday and will go back and read it in more detail now. Thank you for the warning about “Girl, Stop Apologizing.” I believe that I have now learned not to pick up any book that starts with the word “Girl.” See you at your site shortly! In my experience it’s not easy to write a book review, Donna.You’ve done a great job – the only thing I’d change is to dispense with any apology, since it is totally legit not to like a book. And you don’t simply say you don’t like it, you also present compelling evidence to support your opinion. I am amazed at the books that end up on the bestseller list that are poorly written, and this one sounds like a stellar example of this phenomenon. Based on your examples, I think you were generous to give it a two star rating! Hi, Molly – I’m sad to hear this. I have Michelle’s book high on my list of “TBR. I hope it gets better…but I do appreciate the warning! Hi, Jill – Your last comment made me laugh out loud! That’s totally something that I would think! You’re right about the NYT Best Seller List — I still can’t figure that out! When reading for Book Club (even a mini book club such as this), I always read the full book because I never want to let the other reader(s) down. This just happened with For Whom the Bells Toll. I am currently reading it for one of my Book Clubs. Although I usually like Hemmingway’s writing style, by the time that I hit the hundredth page, I was completely over it! I hated the “fake Spanish Translation” writing style, was completely unconvinced by the “sudden romance” and stories set in wartime are seldom my thing. Because of the other members in my book group, I persevered. I am so glad that I did. I am now on page 300 (of 500) and truly can’t put the book down. So, you really never know! Hi, Debbie – Even though my last two posts were book reviews, I seldom review books in writing (not even on Goodreads). That’s strange because I LOVE discussing books. I’m glad that you enjoyed this review — I greatly appreciate your kind comments. You’ve done an excellent job at giving an honest review, something I don’t believe we see enough of, Donna. Humanity would be very dull if we all liked or disliked the same things, and there’s absolutely nothing wrong in giving a review that is both open and honest. I applaud you for doing so. Hi, Hugh – I appreciate your encouragement, especially as you are a published author yourself (now with your second book….congratulations)! You are right that the world would be a dull place if we all dis/liked the same things. Thank you for reminding us of this. I think you did a great job on the review. I haven’t read this book and I don’t think I ever will. I find as I get older, I find it hard to stomach young writers who purport common sense and platitudes as hard-earned wisdom that they have just discovered. I remember how stupid and unsure of myself I was at that age and thank the universe I had the “wisdom” to recognize that I DIDN’T EVEN KNOW WHAT I DIDN’T EVEN KNOW. I spent a whole lot more time listening than talking when I was younger, and I still lean towards that behaviour. Unfortunately, when we do get older and have finally learned a thing or two (the hard way, usually) no one wants to listen to us anymore. They’d rather buy a book from someone is in love with her own youthful reflection and who thinks sparkle is her colour. And I think no one should write a memoir before hitting at least 50. (Unless you are suffering from a terminal disease and this is literally the end of your life.) To save their older selves future embarrassment, if nothing else. You just don’t have the proper perspective before that age, in my opinion. Hi, Deb – Listening more than we speak is a great trait at any age. After a very early chapter of this book, when corresponding with Leslie, I wrote, “I get the plot – look at ME, ME, ME, ME.” I left this out of the above review, but if I had to summarize in just a few words, that would do the trick. I’ve heard of this book, but you’re the first person I know who has read it. It sounds like a flavor of the month type of book. Popular today, but of little lasting value. One that makes me wonder how it is that books like this one get published. Thanks for the review. I wouldn’t call this being critical of someone else, I’d call it being nuanced and accurate. Big difference. Hi, Ally – I always admire your ability with words. “Nuanced and accurate” — I LOVE that….and will definitely be borrowing it! My daughter gave me the book to read but I haven’t gotten to it yet. Both she and another daughter read and loved the book and shared from it what they liked. Maybe it is an age thing that makes you see it differently than the 40 somethings in my life who liked it? I say that because at my age I feel like I have read it all and not much strikes a chord with me. Hi, Victoria – If you do read this book, and discuss it with your daughters, I would be very interested in hearing about their points of view — and your final takeaway! Kudos for your honesty. A friend asked me to edit one of her books and I was appalled at how poorly written it was. I felt backed into a corner because I had to produce something. I did something that saved face for both of us but I won’t ever do that again. As for reviews, I’m still scratching my head about 50 Shades of Gray. That was a best seller? Seriously? Someone else hit the age thing and maybe that book isn’t for retired folks who have experienced more. I am always amused by 40 year old women who write about aging. They talk as if they are 90. Hi, Kate – Editing for a friend or family member can be a very difficult and delicate task. I’m glad that you found a win-win way to do this. Your comment made me wonder what Hollis will think of her book when she is 60+. Sometimes, but not always, books have an age sweet spot. Especially self development or aging books. You are looking through the perspective of the author and sometimes you have long passed that phase and moved onto something the writer hasn’t experienced yet. I can remember when I was much younger and I had so many “aha” moments on personality traits. Now I’m not interested in reading those topics. You did what you promised, and read the thing from cover to cover—more than I would have done! And it’s refreshing to read a review that is brutally honest! As I read through your review, I could tell that you were struggling to find something good to say. I think I’ll stay clear of this book! Thanks, Diane – There definitely are pieces in this book with which I agreed. Sadly, they were often marred by repetition, over-simplification, bragging, poor choice of imagery/expression, oversharing…(take your pick)! Thank you for dropping by and commenting. I always love reading what you have to say. I actually think you reviewed it great. You were honest as to the positives in it and those were some good points… we can always use reminders of them. But you also told your honest opinion. I did a similar review of a book recently – what the positives of what I got out of it, but why I wouldn’t recommend it. Someone still said they wanted to read it. To each his/her own. Keep it real. But no, i’m not putting this one on my to-read pile…. I’ll take your first couple of paragraphs as the key take-away instead! HI, Pat – Did I miss that review? I will go back now and look for it. I’ve learned more from others who were able to give me honest and constructive feedback than from others who were only able to tell me ‘nice things.’ If I don’t know, I can’t grow. The caveat here is that this feedback is given with compassion and balance. Hi, Pat – Thank you for leaving this link. I did read that post in January. I took some time to think about a few of the points that you made so neglected to leave a comment. Thank you for your very articulate summary. Giving us permission to be ourselves makes good sense to me! I think I will pass on this author and any of her books. Just the little you shared, Donna, is enough for me to bang my head on a desk and say “what has happened to literature”? I stay away from a lot of modern drivel. I appreciate your gracious honesty (yes it was gracious and thoughtful) as it can be a rare jewel in a world where authors/books like this get on The NY Times bestseller list. So that’s my stark truth 😉. Hi, Susan – As always, I love your ‘stark truth’. I am sad that I met you at the end of my time in Palm Desert — I have so much more to learn from you! I was just telling my daughter yesterday while we were on a 4 mile hike how much “you helped me” !! It’s very bittersweet that our time was so short 😥. Maybe we will get another chance. Hi, Susan – The Louis Vuitton bag and vacation home In Hawaii (by age 40) were very low points in this book for me (especially when combined with Hollis’ cheer-leading banter to love ourselves for who we are, and refuse to be compared to others). Perhaps she’s found what makes her happy…for now. As I went back over the book in writing my review, I realized just how much of what she said in the first 2-3 chapters was repeated ad nauseam throughout the remainder of the book. Talk to someone. Set goals. And then talk to someone. I am glad to have read “Girl” with you…after you? !…but I don’t think either of us came away with any new revolution. Well-written, honest review. I think book reviewing might be your new calling. I’ll add my kudos to the growing list…great review. If a book does not resonate with you, it doesn’t. If it’s poorly written, so be it. If the language makes you cringe, it’s hard to like something. I actually applaud your ability to find some positives in the message as you read, but you are right, this seems a repetitive rehash of things we already know. Thanks, Nancy – I know many people who say that life is too short to continue reading a book that you don’t like. While I did finish this one, I am not likely to read another one that is similar (or by the same author). Donna, I haven’t read the book and now I will definitely not after such a raw, straight-forward review. I shudder to think who the author thought her audience might be considering her revelations about goal-setting. Is that today’s woman? HI, Suzanne – Several of the commenters have confirmed my guess that this book “speaks to” the 30-40 year old woman. A couple of bloggers have mentioned that their daughters quite enjoy Hollis’s work. With respectful curiosity, I’d love to hear their points of view and discover what connects for them. Donna, after I made that comment, I did a little internet research on the author. Her road to success seems slightly accidental, but she also comes across as a savvy business woman. Kudos to her for seizing the moment and creating a highly successful brand, along with raising 4 kids. I think with respect to her book, it did not matter if she could write, or if she used phrases that our generation find repelling. She has a message (maybe not one that we can relate to on every level) and an adoring following (created largely from a very successful Blog and Pod Cast), that would purchase anything she wrote and devour it word by word. That is the power of being designated an “influencer” in this strange, new digital world where ordinary people are propelled to incredible heights because they have learned to ‘give people what they want’, her words. Literature is so subjective. I have read at least 3 ‘Best Seller” books in the past year that have me shaking my head in disbelief. Where was the Editor, indeed. HI, Suzanne – I like your style! I’m impressed that you went ahead and did some digging. I believe that your hypothesis is spot-on. Hollis is a savvy businesswoman and has a keen understanding of how to use media to her advantage. From that, she has built a HUGE following who are buying up all that she has to say. I can only hope that she uses this power well. Hi Donna, A friend I greatly respect and admire highly recommended a podcast Lewis Howes “A School of Greatness” podcast with Rachel Hollis (September 23, 2018). I recall enjoying this podcast, filled with gems, resulting in goosebumps. One take-away concept for me was that I often ‘live small’ afraid to put myself out there, take up too much space. This was good, timely advice for me especially with writing and beginning a blog. I don’t recall a lot of other specific information except I recall that I would be interested in reading her book when it came out. I was able to download her book, “Girl, wash your face” from the library. I don’t remember it in great detail at all. I wasn’t planning to review and discuss it with anyone. I may have read it more slowly, critically and given it more thought. I don’t recall any gems. Thoughts when I read your review, Donna: I haven’t met you “in person” although, I quickly saw how positivity and kindness is very much a part of you🙂 Therefore, I could see how difficult it must be for you to write about the negatives. Regarding “The advices of value” I agree that our interpretation is very individual. We come with a history of personal issues and strengths. I did come away feeling that the author really wants to be liked and accepted (as we all do) although, this is a large part of who she is. This book may resonate for some people. I will download the podcast again to see why I liked it. Hi, Erica – I did a quick search for the Lewis Howes Podcast with Hollis. Although, I found many School of Greatness podcasts, and many Youtube clips of Hollis speaking, I didn’t find the exact one that you mentioned. Ironically, the one clip that I did watch the first part of (https://www.youtube.com/watch?v=Yv54-P9Qyf8) anoints Hollis as dominating the “personal development space,” especially as a motivational speaker. I haven’t viewed enough of her speaking to make a fair comment. If she is being given that title, she must have the ability to fire up large demographics of people. Sadly, I am not currently one of them. But if she is able to bring inspiration and encouragement to others (and cause people to have goosebumps in a good way), then I do need to applaud that. If you download the podcast again, I would love to hear more of your thoughts on this. I wish I had saved this read of your post for later in the day when I’ve had coffee…a great review and it was kind, Donna. I’m not a fan of books like this. And I saw Leslie’s blog post title with this today and made the connection. The author seems like a Millennial who was never told no in her life. This book might be on trend but not for me. Thanks for saving me the trouble and I hope you leave a review on Amazon! I suppose the author has a new (old) mantra for the next generation. We’ve been there and done that! Hi Donna! Look at you with two book reviews in a row. They can be fun or at least interesting huh? And yes, I did read this book because one of my book clubs choose it. And although I usually write a book review for any book I read for my book clubs, I NEVER write a review for a book that I can’t recommend. I understand why you did though and probably would have made that exception as well. Why don’t I review books I don’t like? Probably for two reasons, 1) I think my site is primary about promoting the positive–so if I’m not “positive” about something I don’t include it. And 2) because I’m an author too I realize what effort it takes to publish a book–even a bad one–and don’t want to discourage anyone from writing one themselves. I also realize there are likely a lot of people out there who read my books and think they aren’t very good (and yeah, I’ve had people tell me that too!) so I try to be gentle with all authors if I can be. Yikes! I didn’t mean to make your toes curl. But my sincere guess is that this is not a book that you would like. Thank you for your candour and honest review. I almost read this book. I admit to perusing it but I just could not get past the title and the use of the word Girl. Nothing wrong with that word if you are a girl. Last time I checked, I have not been a girl for ages. I prefer calling myself a woman and using that term to define all of my women friends and my two daughters. I believe this author has a website called The Chic Site https://thechicsite.com/ . From what I gather, the advice given is repetitive and nothing innovative has been offered. At my age, I figure I have enough life experience to rely on my own advice or the advice of close friends. It seems this book is another book telling us how to be. Just another voice added to the popular mix of advice voices that surround us these days. It seems everyone is telling everyone how to be… I admire the author’s courage to publish what she believes in tough and wanting to share what she has learned. There is an audience for that kind of message. I am just not part of that audience. I prefer fresh new ideas, authenticity and audacity. Thank you for sharing your thoughts. Much appreciated reading you. Hi, Julle – Your summary is perfect: “There is an audience for Hollis’ message. I am just not part of that audience.” Thank you for sharing the link to Hollis’ website. I did have a quick peek. Once again, I am not an audience for that either. e.g. — Rules to Wearing All White, 100 Ways to Style Your Denim Jeans……yup, definitely not me! Thank you so much for stopping by. It is a pleasure to meet you here. Thanks for reading and providing a balanced review. Thanks, Tracey – I greatly appreciate you reading and commenting! I give your review 5 stars. It was balanced, articulate, and honest without meanness – not an easy alliance. Hi, Joanne – When reading the lead-up to Hollis’ Vuitton Handbag purchase I was hoping against hope that she would walk into the store confident that she could buy the bag, have an awakening, walk away, and then use the money to support a cause for which she was extremely passionate. I had almost convinced myself that that was going to happen. Sadly, it did not. Thank you for the five-star review. You made me smile! Hi, Sue – Sharing this book with Leslie, and writing our thoughts back and forth to each other was definitely the highlight for me. I got to know Leslie so much better, and she was excellent at provoking my thinking (actually, she was much better than Hollis). I highly recommend this “mini book club” format! It would be wrong if you liked everything. This is a very good point! Thanks so much for stopping by. I greatly appreciate it! Reading this post makes me so very sad that we don’t live next door to each other (or, at least on the same block). I think we could have so much fun in a two-women book club. Your review was so honest and refreshing. I’m pretty sure that I’d have a similar reaction if I read the book (which, mercifully I have not) because repetitious, poorly constructed, tone-deaf writing drives me nuts. I’m at the point in my life where I won’t waste my time reading a book that doesn’t grab me. I’m not big on self-help books anyway but this one sounds even more tiresome than usual. And, anyone who brags about buying an overpriced status symbol isn’t someone that I’d likely take life pointers from. Yay to you and Paul living nearby!! 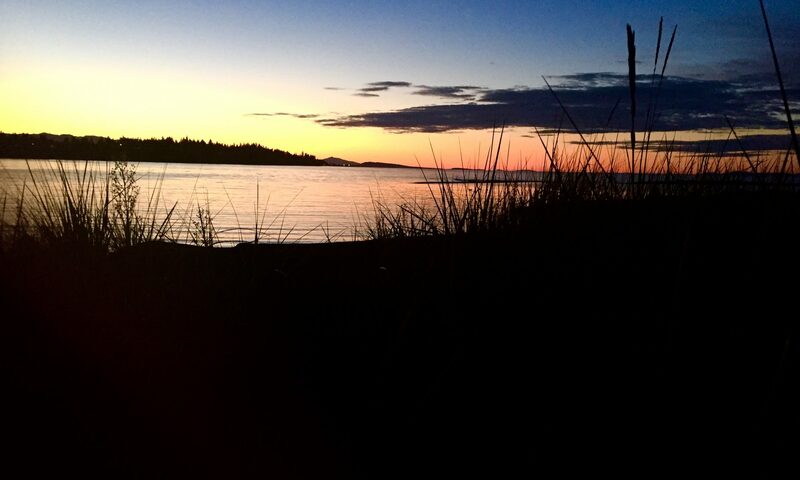 Perhaps on your upcoming trip, Richard and I can entice you with beautiful Vancouver Island!! 🙂 I would love to be in a book club with you, anytime, anywhere! I love how you always get to the heart of the matter! PS – Waiting for your next post! 🙂 No pressure of course! Well done for reading the book and publishing an honest review! I also read Leslie’s review and I can truly say that the book isn’t for me, either. I find writing reviews one of the hardest things I’m ever asked to do. I hate to be critical of anyone for one thing and then it takes me ages to write a review because I get so nervous (and let’s be honest – peevish!) that I can’t think of the right words to describe how I felt about the book. I think your review was well-balanced and fair. You gave examples of the author’s writing style and you wrote with humour! I loved it! Thanks, Clare – I LOVE discussing books, but don’t frequently write book reviews. Even though I do try to “praise publicly and criticize privately,” I did find this review very easy to write. I also LOVED having the two-person book club and will try to seek out more opportunities like that one. Thank you for your kind words – they are greatly appreciated. Thanks for your honest review. I almost picked up a copy at Costco for my daughter, but after glancing through it and reading some paragraphs, I set it back down. What little I read was not impressive and couldn’t understand the rave reviews. I’m off to read Leslie’s post! Hi, Ingrid – Thanks for stopping by. My belief is that this book does not speak to our age group, but targets the 30-40 year old — especially ‘mommy bloggers’. If your daughter does read it, and likes it, I’d be interested in hearing her thoughts. This is a great review. It is honest. And frankly from what you have described and shared I would have to say that I agree with your assessment with regards to your reasoning. I have not read the book, but based on the excerpts you provide I would not want to and I definitely thank you for being so real in your review. Definitely refreshing. Hi, Peta – Thank you so much for stopping by. Based on your writings that I have read, I do not believe that this is a book that you would want to spend any time on. I love the community in this little corner of the blogosphere and how we connect, inspire, learn and grow from reading each other’s thoughts and adventures. Thank you for all of your contributions to this. Wow. More than anything else, Donna, I’m amazed at your perseverance in finishing the book. Her expressions certainly are cringe-worthy. Hi, Marty – Thank you for the “bolded wow” — it totally made me smile! You make a very good point about the (unintended) message woven inside the handbag story. Hopefully, readers will see if in that light! Hi Donna! What a great review. Good for you for finishing this book and for providing an honest and extensive summary. I couldn’t do either. The way this woman writes would drive me crazy and the topics she covers, I could never relate to. Plus, when did self-boasting become an accepted, even popular, writing style? Yikes! I find self-help books often repetitive. And, I’ve never understood how poorly written books made the best seller list. Not my thing, so thanks for steering me away from this book! Hi, Liesbet – I’ve never gotten into reading self-help books either. Too often, one can read all that they have to offer on the book’s cover.And no need to thank me, I am confident that you would never have picked up this book anyway! Hope all is well with you. Yup – honky dory we are! Wishing you warmer weather soon! I doubt that I would have picked up this book anyway, but I enjoyed and appreciated the depth of your review. Great job, and very thoughtfully done. I am glad to know that you are reading Hemingway now as he is a hero of mine. Lately, I have returned to some of the classics myself with “Huckleberry Finn” among some of the recents. Now that Helen and I are on the road, I have opened up “Travels With Charley” on my Kindle and am loving it. Still love your blog. Now, if you’ll excuse me, I am going to wash my face 😉. Like you I tend not to review books I wasn’t keen on – partly because in most cases it’s due to the fact that it’s a different genre or theme to one I’m comfortable or I haven’t been drawn to either the voice or the character – and neither of those things is (usually) the fault of the writer…it’s a bit like not being drawn to a person who other people like… It’s therefore uncomfortable to review when you’re on a promise to do so, but know the judgement isn’t a positive one. I read Leslie’s review too and love how the book prompted such strong reactions in you both – and the communication that grew around it. I enjoyed reading this review more than I suspect I would have enjoyed the book itself – and I loved your honesty…not that I’d expect anything less. Hi, Jo – Thanks for dropping by. Sadly, I don’t believe that it was the genre of Hollis’ book that caused it to rate so low with me. The communication with Leslie around the book was definitely the best part of all. Without that, I would have quit reading shortly after Chapter 1. Yeah…it sounded like the writing was not great ie word count “padding” & overly superior POV. It would have turned me off too. It truly amazes me what can become a “best seller” and be proclaimed as a “Game Changer”. There’s obviously something that I have missed! I also read this book and agree with pretty much everything you wrote. There was nothing new here for me and most of it was shallow with lots of proclamations without a lot of discussion of how to actually do the thing. That said, we are not her audience. She is writing for the 20-30 somethings. They have not heard it all before, and she speaks their language and uses their cultural references. She has built a media empire somehow, and she does deserve credit for that. Hi, Michelle – Thanks so much for stopping by. I like your balanced approach. I agree that Hollis is exceptionally driven, and is brilliant at creating an incredible social media following. My sincere hope is that her message serves her followers well. Every time I come across this post title, I think of the song recorded by Miranda Lambert – Mama’s Broken Heart. Now, there were some words not to live by. HI, Mona – I hadn’t heard of Lambert’s song before. I just looked up the lyrics online. Hollis had claimed that her next book “Girl, Stop Apologizing” was influenced by Demi Lovoto’s “Sorry, Not Sorry.” I wonder if “Girl, Wash Your Face” was consciously or unconsciously inspired by Lambert? There are quite a few similarities between Lambert’s song and Hollis’s title…as well as Hollis’s conclusion. Thanks for stopping by. Do you have a website? I’ve looked for it but could not find it. Donna – thanks for saving me time! I’ve heard about this book here and there and wondered if I should read it. Now I won’t. Thanks for the honest review. Donna, I’ve never heard of this book until now, and I think I’ll pass on it. Sounds like the sort of book the author herself will find cringe-worthy one day when she’s full-grown! Considered the suggestion that one’s level of enthusiasm for it might be age-related. But then, I thought, Nah–I was never that self-absorbed at any age. And spending $1,000 on a designer handbag was her “proudest moment?” That tells you something right there. Nope, not the book for me. Also, I’ve grown a little weary of all the advice out there to “take care of yourself”–when self-indulgence seems to be at an all-time high. Thanks, Jean – I greatly appreciate you stopping by. I love your reflection that youth does not need to equate ‘self-absorption.’ Sincerely, I got much more out of your recent guest post on Sue’s site, than I did out of Hollis’s entire book (except for the sharing with Leslie part, which was awesome)! It sounds like a book I wont be reading anytime soon. But amongst the drivel, there is this: ‘Our judgments keep us from connecting in more profound ways.’ That is a gem. Yes! I do love that line. Sadly, there was much filler and hype surrounding it! Well done for your very honest review Donna, not sure if I could’ve been so brave. Didn’t sound like my cup of tea either, especially her writing style. Thanks, Sam – I think because Leslie and I had been discussing the book back and forth for several weeks, this post was very easy to write, I do understand that this author has a HUGE following…but I will politely be passing on any further books from her.